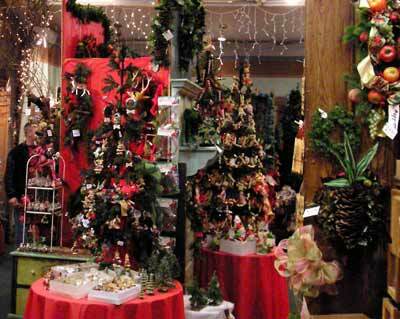 For many people it just wouldn't be Christmas without a trip to Hixson's Floral Barn on Detroit Avenue in Lakewood. Let's meet the man behind the tradition. William (Bill) Hixson was born in Berea Ohio on April 8, 1929. "I was born on the kitchen table and I've been hungry ever since!" His mother, Kathryn and his father, Wiley Carroll Hixson were living in Tennessee just before coming to Cleveland. In fact, the size of Wiley's family (Wiley was one of twelve sons) could be the reason the town was named Hixson, Tennessee. Bill was the second of two children born to Kathryn and Wiley. His older brother was named for his father and Bill is "grateful I wasn't born first, so I got to be Bill and he got to be Wiley Carroll." His brother is an electrical engineer greatly responsible for putting a monkey into space. Hixson's supplied the webbing and the tape used to protect the monkey in the program. When Bill was still young he moved from Berea to Parma (Wentworth Avenue). It was during the Depression and Bill and his family lived in a converted garage. Around age ten he moved to West 70th Street. Even at this young age he was very interested in growing things. He made a small garden at his W. 70th street home. "I have seen the play the Fantasticks at least thirty times. I would be seeing it still if it hadn't closed. There is a wonderful line in the play: "Plant a radish, get a radish. Not a brussell sprout." With people you just don't know what you're going to get." He loved the West 70th Street neighborhood. The family never had to lock their doors. There were trolley cars on the street with wicker seats and pot bellied stoves. On the other end of the street there were railroad tracks. "Biggest mistake ever made was getting rid of trolley cars." He went to Thomas Jefferson Jr. High School and at the same time he took adult education classes on growing plants at West Technical High School. His family moved to York Road (which was then by Crile Hospital and is now a CSU extension) and he believes it's mainly the result of his parents wanting to promote and support his love of growing things. The home on York Road was nearly 15 acres. It was an old farm house that he just loved. "It had five chimneys but no fireplaces. In those days chimneys were for the pot bellied stoves!" He remembers one year it got so cold in his room that there was a full inch of ice on his inside wall. But he was resourceful and did what they used to do in the "old times." He heated up a brick and wrapped it in flannel. Then he climbed in on top of it and tried not to move all night. Come Spring he planted a forty foot row of sweat peas and had almost 300 mums in bloom for the summer. He tried to sell his tomatoes and corn in front of his farm house, but wasn't very successful. "I didn't know I could take my wares to the Farmers Market to sell." Bill was still very much interested in going to West Tech, but now that they moved the process was a little more involved. He walked 2 miles from Crile Hospital to Brookpark and Pearl where he took a streetcar to West 25th. He transferred to another streetcar to West 89th to West Tech. There was a wonderful teacher there by the name of Albert T. Haag who taught Horticulture. This teacher also sponsored a Horticulture Club and a Naturalist Club and Bill joined both. He took Bill and the class to see the sights of places in Geauga County where wild orchids, morel mushrooms and wild blueberries grew. Bill loved it all and soaked up the great wisdom Mr. Haag was passing on to him. Bill had a classmate who had signed up for a Flower Arrangement Class and convinced Bill to join him. The classmate walked away after the first class but Bill stayed on for three years, becoming a favorite of his teacher. Bill was about 18 years old at this time. His teacher became ill and asked Bill to take over the class for him, which he did. She soon after died, and Bill continued teaching. While in High School he also delivered flowers for a florist on East 2nd in downtown Cleveland. He would also sell corsages door to door at Easter and various special occasions. He used the money he earned and the money his parents gave him for lunch to buy plants. He worked on the farm for about a year and then went to Mercers Flowers on West 25th near Clark. He learned some very good business lessons from the Mercers. He learned to keep things organized and beautiful for the customer, but "most importantly I learned from Mrs. Mercer to always offer the best you have." Next Bill went to work at Knobles Florist with his friend Bob Jones and his mother, Irene. In 1950 he was off to the Army for 2 years. But his time at Knobles was a very important time for him. In about 1948 he and Irene Jones opened the Knoble- Hixson School of Floral Design. Among other things they did programs for Garden Clubs. He continued to teach when he came home on furloughs. While he was at Knobles he decided to open his own shop and within a month of the decision he had a business at 13615 Detroit Ave. "I had more imagination then money though." He had $3200 to open his business. $1200 went into a station wagon, $1000 went to equipment he bought from a florist going out of business and the rest "well there was a million ways to spend the rest." In order to be approved to be an FTD provider you are required to send them photos of your front window, left window and right window, so they can see from all views what your shop would look like. 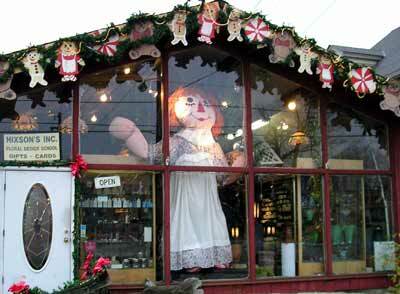 Because of his limited inventory, Bill made a beautiful front window and photographed it. Then he rearranged the same items in the left window and then the right window and photographed them as well. "There too I had more courage then sense." He received the FTD approval. He was a part of the Floral Association and one day was attending a lecture on a brand new product to hold individual stems in place in an arrangement. The product was orange and had chicken wire. The inventor asked him what he thought and he candidly and honestly suggested a number of changes including change the color to green and make the substance denser. The inventor took his suggestions and OASIS was born - a tool used by every floral designer in the nation, if not the world. His mentor was a woman by the name of Tommy Bright. She headed the Bright School of Floral Design in Chicago. He had taken one of her three-day classes and she was very impressed with his work. She asked him to go across the country with her and he agreed. Together they taught their classes and techniques all over the country. Their trips were sponsored by Oasis and a candle company that eventually became Lennox China Co. When she got sick, he took over. "I felt like a finger painter following Michelangelo." He did his first solo show at age 26 in Norfolk, Virginia. It was Tommy Bright who had encouraged him to move to his current space and call his establishment a "Flower Barn" instead of something ostentatious. And in 1959, that is exactly what he did. He hired wisely as well. When he first opened he hired Eunice a wonderful assistant "Right hand gal" who is still with him today. He decided early on that he would never surround himself with unhappy people. "They'll just pull you down." "I said before I had more imagination than money and it was still true then and probably still true today." He purchased a case of old fashioned candy, what used to be penny candy, for the front of the store and instantly it changed the whole attitude of what they would carry. They moved toward old fashioned things, things of beauty and elegance and fine craftsmanship. He bought stained glass windows for $5 and $10 from garbage men who brought them to him from people who had thrown them away in an effort to modernize. Mrs. Bright had taught him about antiques and he was getting the chance to put that knowledge to good use. His school became very successful. He had students enrolled from all over the country and, in fact, the world. "You can tell a lot about the culture and the times by flowers," says Hixson. "In the 40's gardenias and orchids were popular, they are graceful and beautiful. In the 50's and 60's miniature carnations came into being. And then in the 70's it was the Daisy. Free spirited daisies, just like the times. And now, well like morals and clothing and everything else, the theme for the 2000's is that anything goes." He does not agree with people that claim flowers are too expensive. He remembers buying his mother a pocket book plant (Calceolaria) in 1947 for $3.50. That same year a station wagon sold for $1000.00. Today the plant would be $7 or 8.00 but the car is $20,000.00. "I think doubling in price in more than 50 years is not just reasonable but actually quite inexpensive. Think what the cost would be if the plant followed the percentage of increase the station wagon had!" Bill loves his customers, who he generally refers to as friends. He has many levels of generations coming in to see him during Christmas especially. A grandmother will come in with her daughter and her daughter's daughter and eagerly await sharing this tradition with yet another generation. "We don't sell one thing people need. There is nothing in here about need. It is all about want and feelings." As we continue this interview more and more people come through the store. He greets each one with a sincere "Merry Christmas." 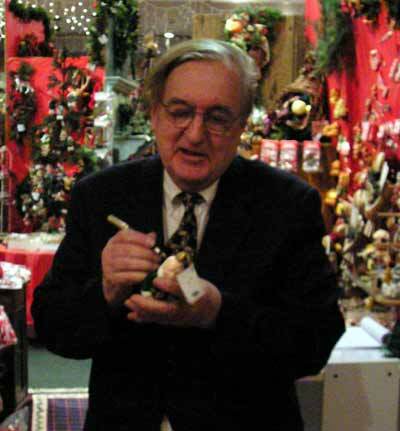 He points out special treasures to a little girl and signs her ornament for her - it's one of his own creations. He talks to a woman who has been coming faithfully for about 38 years and another who comes with her family every year and still sneaks off by herself to come again. 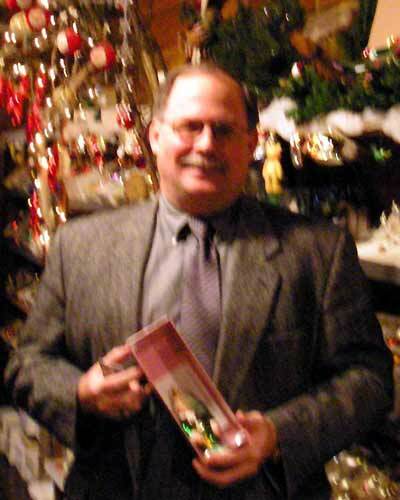 There's a gentleman purchasing Bill's design glass ornament of Mr. Jingeling for his brother "Colonel Tom" who has been in active duty since 1981. The brother, Pete, has many Hixson ornaments himself and wants to share some Cleveland traditional Christmas joy with his brother. Pete had been military for many years himself and knows how much a touch of home means. Some of the children coming in are excited because Santa Claus is there every day and they are hoping to get to see him. Bill assures them that they will. 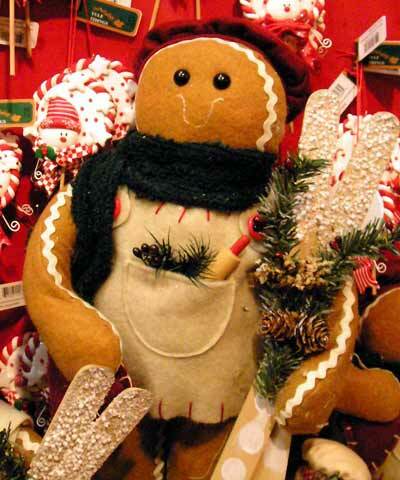 He also explains some of the delightful Christmas traditions to them. 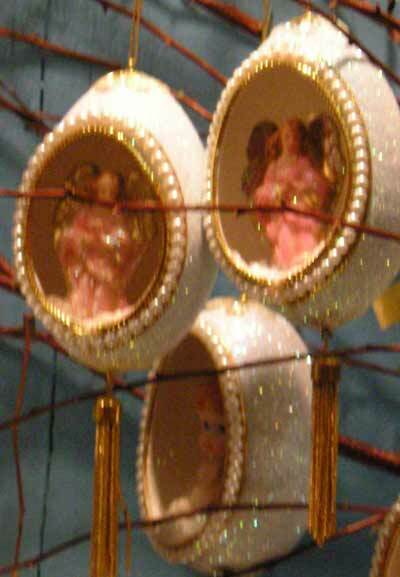 For example the birds nest in the Christmas tree was placed there to insure health, wealth and happiness for the year. It was the Jews that started the tradition of an apple. If you cut in half, and have been good that year, you will see a perfect star. "Of course" Bill winks and whispers "you'll have a perfect star no matter what." He has a collection of over a thousand legends to share. He has taught in all but three or four of the States and has lectured and taught classes innumerable times in Japan. He has written books on wedding flowers, funeral flowers and arrangements in general. His Christmas book has been reprinted three times. One of his students was a woman by the name of Nancy Clark whose husband was in the military. As she moved form state to state she stayed in touch with Bill asking for recommendations of florists in a new area. She became a beautiful floral designer as well. When her husband was finally transferred to Washington she applied for a job at the White House as a floral designer. As she tells the story she was told they had all the people they needed until she mentioned that she trained under Bill Hixson. Then she was given the job. Bill was then brought on board and has been there through 8 years of Ronald Reagan, 4 of Bush Sr., 8 of Bill Clinton and 4 of George W. Bush. He has helped design the flowers for many inaugurations and inaugural balls, as well as state dinners for Queen Elizabeth, Prince Philip, the emperor of Japan, Mikhail Gorbachev and many others. Come Christmastime, Bill helps with the tree and is always in charge of the decorating of the East Rooms. "There are four mantles, four trees and 6-8 wreaths, among other things." Many of the other designers respect his opinion so much that they ask for help in their designated area. Bill can quickly assess a situation (too bland, too bright, not enough color, etc.) and it is the rare exception when his advice is not followed. 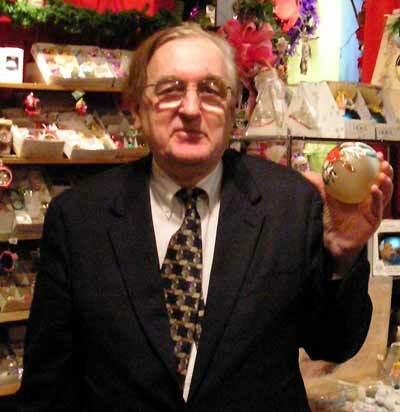 He has signed his personally designed glass ornaments all over the country. 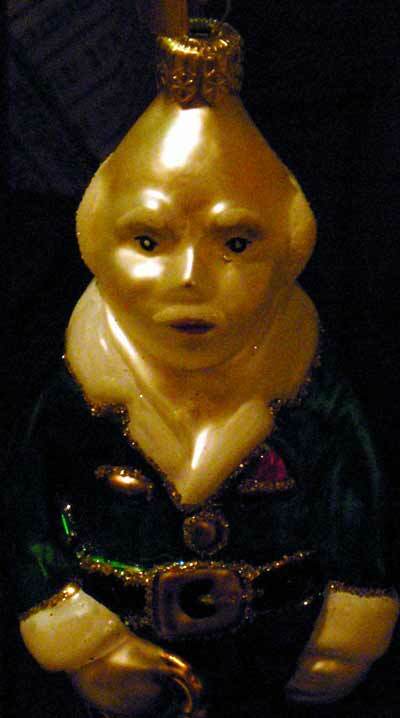 "Many of the ornaments have glitter. I remember one day in particular I was coming back from a signing and I stopped in McDonalds. I guess I had glitter all over my face and the man next to me just smiled and said "you must have a very interesting life." Of course I had to tell him about the glitter, but I also had to agree. My life is very interesting." The old Cleveland Press did an article on Bill one year and they used a line in it that he would not mind having on his tombstone. "He has the dignity of having dirt beneath his fingernails." This is what Bill Hixson loves about his business and his life's calling. He does it all and enjoys it all. He remembers Mrs. Bright again. "She was only 5' in height, but she was such a tall, wonderful woman and she did what she had to do and taught me to do the same." He found Barbara Bush to be very much like Mrs. Bright. The President's family has Christmas trees in their personal quarters that are not done professionally. She asked Bill one year if he would like to see their personal trees and of course he said yes. "She just asked for half an hour to straighten things up and then showed me the trees." 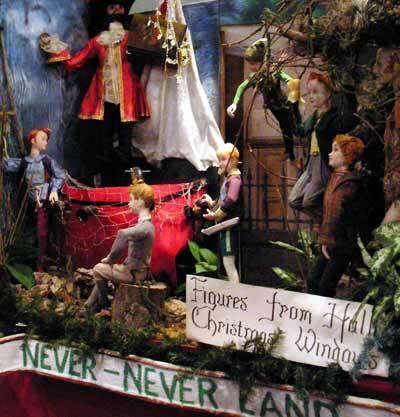 In addition to beautiful glass ornaments, figurines, dolls and every imaginable Christmas decoration he also has over 400 of the original Halle window decorations. 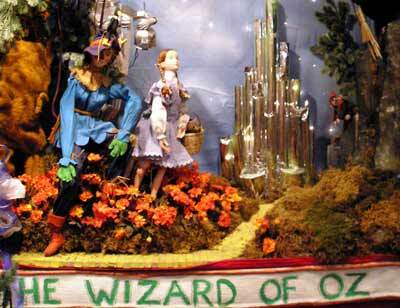 On display this Christmas are part of the Wizard of Oz and Peter Pan. "These are the originals - not just a replica!" Bill has no children of his own, but he is the proud godfather of three including twins in England. He has been in Europe professionally and socially many many times and has come to know so many people as special friends. He suffered a great personal loss when his father died. Although they had been very close, they were never affectionate and Bill decided that he would never let anyone else leave him without knowing how he felt. "I tell my students, hug a person while you can. Don't be afraid to touch them." 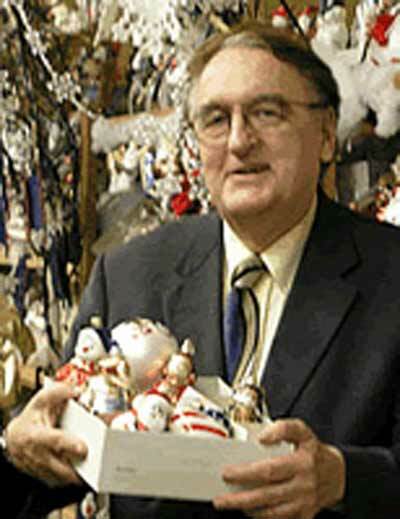 From the huge Raggedy Ann doll that has stood in his window for over 40 years, to the hand made ornaments, to the legends behind the traditions, to the Halle window animation, to his smile and "Merry Christmas" greeting Bill Hixson has earned the right to be called "Mr. Christmas." Although he is famous throughout the world and has designed arrangements from the White House to Japan, he is happiest in his own Flower Barn where he can talk to each child one on one and share the joy of the season. He is just as excited about Santa Claus coming as they are. 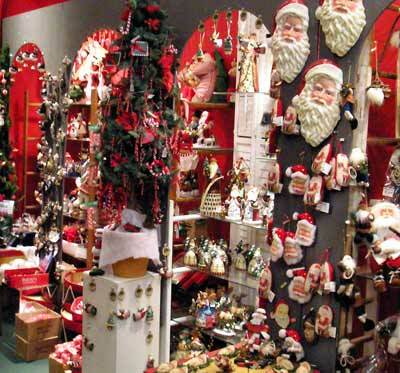 He is at home in Christmas-town surrounded by the beauty of his ornaments and the majesty of his flowers. He is a talented man and a happy man and he is willing to share the beauty he has discovered in flowers and Christmas with everyone. What a special Christmas present he is.